With origins dating back to the 16th century, the house at Vann in Hambledon, Surrey is certainly deserving of a special garden. 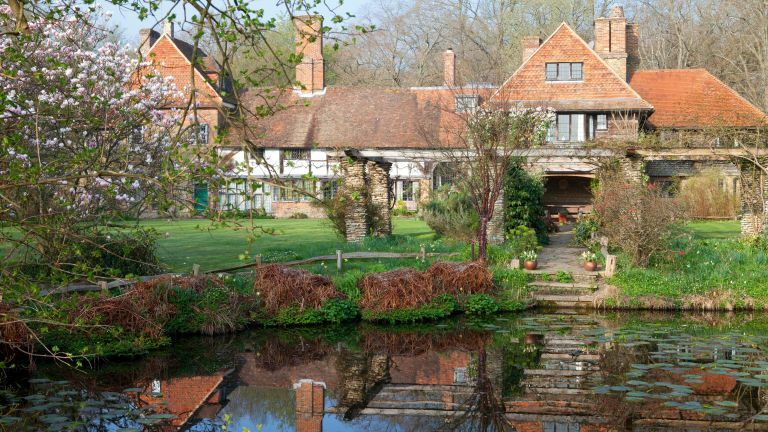 The Arts and Crafts garden design, with elements created by renowned Edwardian horticulturist and landscape designer Gertrude Jekyll, perfectly befits the home’s architecture and its lovely setting, tucked away in the lanes of the Surrey Hills. The property has been in the Caroe family for over a century, and when Mary and her late husband Martin inherited it in 1969, the garden was still very beautiful, its structure and hard landscaping intact. 'Even though we had four very young children at the time, we enjoyed restoring the gardens. Martin had always been very interested in the garden, and I am sure he married me because I was a good weeder!’ Mary laughs. Read on to find out how they breathed new life into the garden, then find more gardening advice and inspiration. Guiding the couple’s rejuvenation of the Grade II*-listed garden was their desire to keep the spirit of the place and its illustrious pedigree. Weeds and brambles were cleared, the heavy Wealden clay improved with tonnes of compost, hedges reshaped and plants added. Being true to the ethos of Jekyll and the Arts and Crafts movement was always in Mary’s mind as she restored the site. See here for advice and information if you live in a listed home or are looking to buy one. Spreading out from the mellowing timber-frame house, the garden extends to five acres and is divided loosely into different areas with yew hedges and structured beds. Close to the house the style is more formal, then extends out to the naturalistic wild areas. In spring the scene is a meld of pastel blossom, from Magnolia stellata and soulangeana, fresh unfurling greens, carpets of soft yellow and glowing white narcissi under a canopy of skeletal branches, with just an occasional splash of intense colour from vibrant tulips, a crimson camellia or Chaenomeles japonica (flowering quince). A striking Bargate stone pergola, underplanted with lime-green euphorbias, nodding hellebores and spring bulbs, leads from the house to the large quarter-acre pond, from where the water cascades to a succession of small ponds. It feeds the unique water garden designed by Gertrude Jekyll, who in 1911 visited Vann from her nearby home of Munstead Wood. This is believed to be the only water garden Gertrude Jekyll (1843-1932) ever designed, laid out and planted, despite often writing about informal water gardens – so it is a real gem to be savoured and treasured. The water garden proved to be the most challenging part of the garden to restore as it had been neglected, was covered in bindweed and ground elder and had silted up in places. It needed digging out and clearing, with many plants moved into the vegetable garden and then replanted using the plant list left by Jekyll, with the same or similar varieties. There are massed water-loving plants originally supplied by Jekyll and now increased and naturalised. A surprising number of the 1,500 plants put in by Jekyll still survive in the garden. These include the original 50 Fritillaria meleagris (snake’s head fritillary), now multiplied into drifts of hundreds, carpets of Caltha palustris (marsh marigold), dainty nodding snowflakes, a haze of blue forget-me-nots, and special, but unnamed, narcissi stretching as far as the eye can see. Completing the vision are meandering paths and criss-crossing bridges to slow your journey and let you immerse yourself in the atmosphere. ‘My favourite time to stroll is in the evening when the white daffodils glow in the late light,’ says Mary. The use of massed blocks of plants in harmonious colours and textures is typical of the Jekyll style, creating an environment that looks like a work of nature, not of man. As with all gardens, there is always something that needs redoing, and if Gertrude Jekyll were alive today she would be bound to suggest something new if a plant wasn’t working.